Chicago, Illinois – Tootsie Roll Industries is proud to announce the introduction of NEW Tootsie Pop Drops. America’s number one selling lollipop is now available in a bite size piece. Tootsie Pop Drops are a bite sized version of our traditional Tootsie Pops … just without the stick. Each Pop Drop is a bite sized hard candy piece with a chocolatey, chewy Tootsie Roll Center. 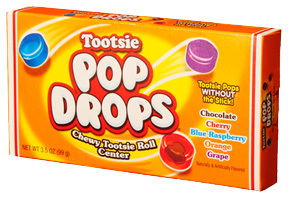 Pop Drops are packed in brightly colored 2.25 ounce foil laminate pouches. These pouches were designed to not only provide for strong brand recognition but also provide consumers convenience and portability. Each pouch contains an assortment of our most popular Tootsie Pops flavors: Chocolate, Orange, Grape, Cherry and Blue Raspberry. These pouches are perfect for today’s on the go consumers. Pop Drops are packed in two colorful formats: A 24 ct. display carton with 12 cartons per shipping case and a 96 ct. Power Wing Shipper. Pop Drops are priced competitively with other count goods in the market place and are currently shipping to wholesalers right now.